137 min [ ] - Socially inept garbageman Simon Grim is befriended by Henry Fool, a witty rogue, but untalented novelist. 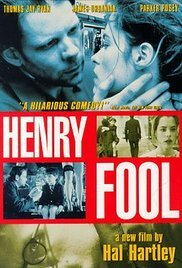 Henry opens the world of literature to Simon, who then writes "the great American poem.” As Simon begins his ascent to the dizzying heights of Nobel Prize-winning poet, Henry sinks to a life of drinking in low-life bars. Henry's own attempts at fame result only in rejection by the same publisher who contracts with Simon to distribute his work. The friends fall out and lose touch until Henry’s criminal past catches up with him and needs Simon’s help in fleeing the country.